Leonard Nimoy – Spock on Star Trek – passed away on February 27, 2015. Like millions of Trekkers the world over, I took a deep breath when I heard the news, reflecting on his passing as if I knew the man. It was a deep loss; a fantasy had been shattered. Here is why. My fascination for the actor and character was centered on the original series, which is where my heart has always been. I’ve enjoyed other versions of Trek but nothing quite compares to the original. Who can’t love a show that eschews seat belts, right? Don’t miss the JustUs Geeks interview with Walter Koenig from Star Trek: The Original Series! Strangely enough, though, these are not the episodes I find most appealing. 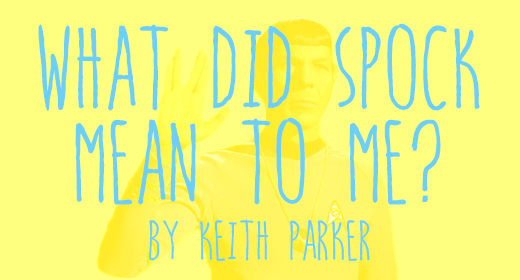 They were awesome, to be sure, but it was Spock’s unflappable nature that I found fascinating. There is probably not a better example than Harlan Ellison’s award-winning episode, “The City on the Edge of Forever.” Widely considered the best episode of the entire 700+ episode franchise, Spock’s chilling reveal (“Edith Keeler must die.”) stands in stark contrast to Kirk’s deep, passionate love, creating a dramatic conflict that not only makes it the greatest Star Trek episode of all time, but one of the greatest television episodes of all time. If you have not read Nimoy’s biographies, I am Not Spock (1975) and I am Spock (1995) I cannot recommend them highly enough. Moreover, the audiobook of the latter is narrated by Nimoy himself and may even be better than the print version. Live long and prosper, indeed. Until next time, peace. @joshsteen @JustUsGeeks Thanks so much for allowing me to share my thoughts about #LeonardNimoy ! @keith0363 @JustUsGeeks More than happy to do so!